This week’s simple side is brought to us by Anne of Quick and Easy Cheap and Healthy. As the title implies, Anne regularly shares healthy recipes that don’t require tons of time or money. Anne has a child with food allergies. While Quick and Easy Cheap and Healthy is not completely allergen-free, most of them are easily adapted. 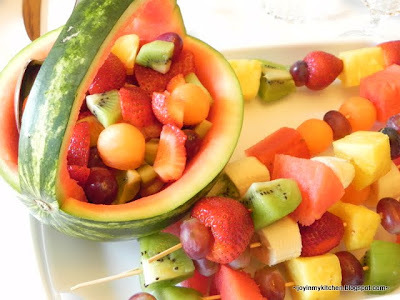 I should mention that Anne has a second blog When Food is Dangerous that is top 8 free. I often just chop up whatever fruit is in the fridge into a take-it-or-leave-it conglomeration, but I also like to come up with intentional creations that take into consideration flavors, textures and colors. There are a few such standbys that serve me well, but now and then the urge strikes to try something new and perk up the taste buds with some additional, unexpected flavor. 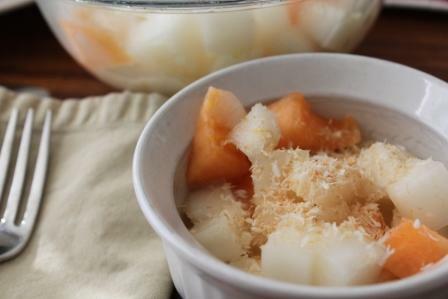 You can read the rest of the story and find the recipe for this Refreshing Melon Citrus Salad here. I hope you are enjoying this simple sides series as much as I am. In case you missed it, last week Steph at The Cheapskate Cook shared a beautiful Tomato and Basil Bruschetta recipe. I can’t wait to see what Mary at Barefeet in the Kitchen comes up with next week. Then it’s my turn! I am thrilled to announce a new series called Simple Sides. Every Thursday during the month of August, some blogger friends and I will be sharing a few of our favorite summer side dishes. Up first is Steph at The Cheapskate Cook . 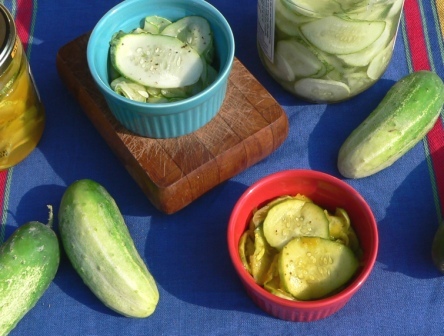 Steph’s blog focuses on real food on a budget. Make sure you read this inspiring series on how she and her husband survived spending only $25/week on whole foods. 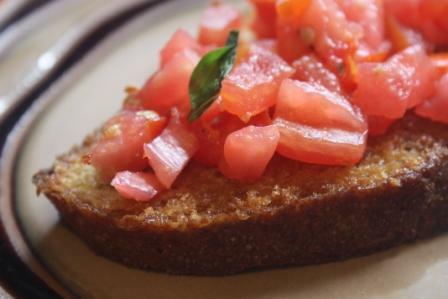 This week she is sharing this beautiful Tomato and Basil Bruschetta recipe. When I saw this salad on Simply Recipes, I knew I had to make it. 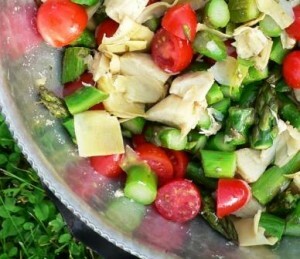 I can’t resist artichoke and I love that asparagus is currently in season. This salad is fresh. It’s beautiful. It’s quick and it’s allergen-friendly. 3 Put the asparagus and all the remaining ingredients into a large bowl and mix to combine. Add as much of the marinating liquid from the jarred artichokes as you like. Serve chilled or at room temperature. You may also like Asian Chicken Salad and Ginger-Lime Marinade for Chicken. Want more allergy-friendly recipes? Be sure to sign-up for free e-mail updates or become a Facebook fan in the side bar. This is the dish I get asked to bring to dinners the most. 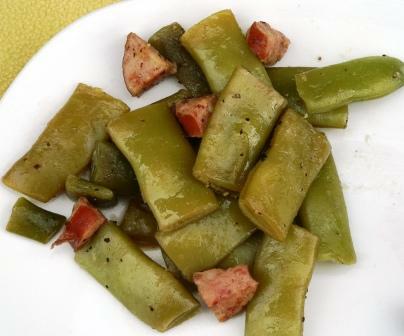 Any type of sausage and green beans will work but my favorites are Polish Sausage and Italian Green Beans. This makes a big pot full! 2. In a large pot, brown sausage over medium high heat. This is the most important step. You want to have lots of brown stuff stuck to the bottom of the pan. The sausage should be almost burnt. 3. While the pan is very hot add 1/2 – 1 cup of cold water. Scrape all the stuff off the bottom of the pan. It will lift off easily in the water. 4. Stir in the green beans. Sprinkle in the seasonings and mix well. 5. Cover and cook on medium low until beans are tender. 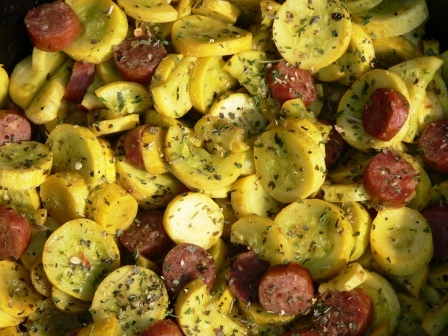 You may also enjoy Italian Sausage and Summer Squash Skillet and Skillet Meal: Pizza Rice. This post it part of Real Food Wednesdays, Whatcha Makin’ Wednesdays, Gluten Free Wednesdays, Pennywise Platter Thursday, Full Plate Thursday and Real Food Weekly.